Background & objectives: Limited studies have been reported on Japanese encephalitis (JE) with reference to microarray data analysis. The present study involved an in silico approach for identification and characterization of differentially expressed genes in human microglial cell (CHME3) samples, infected with P20778 strain of Japanese encephalitis virus (JEV). Methods: Gene expression data (GSE57330) belonging to mRNA expression profile of CHME3 cells infected with JEV, was downloaded from the gene expression omnibus (GEO) database, processed and normalized by robust multichip averaging (RMA) method using affy packages of R. The Bayes method was used to correct multiple testing. The log fold change (logFC > 1) and p < 0.05 were used as cut-off to identify differentially expressed genes (DEGs). The newly identified hub genes were set at the centre for construction of protein-protein interaction network using search tool for the retrieval of interacting genes/proteins (STRING) database considering human genome as reference. Gene ontology and pathway enrichment analysis of the hub gene and its associated genes were performed using STRING and DAVID tool. Results: Microarray data analysis revealed that STAT1 gene was down-regulated during JEV infection. STAT1 gene was found to interact with tyrosine protein kinase family members, and showed strong interaction with JAK1 and JAK2 genes. Interpretation & conclusion: The identified transcription factors and the binding sites in the promoter region of STAT1 gene might act as potential drug targets in near future. Flaviviruses are a group of positive-sense single-stranded RNA viruses belonging to Flaviviridae family that includes medically important species such as dengue, Japanese encephalitis (JE), and West Nile viruses. Among these single stranded RNA viruses, Japanese encephalitis virus (JEV) causes infection of the central nervous system in humans. It has been estimated that the mortality rate of JE is very high ranging from 20 to 50%; especially in regions where JEV is widely distributed like in East and Southeast Asia. Among the 50,000 annually reported human cases of JE in Asian countries, 10,000–15,000 results in fatality,. A high proportion (nearly 50%) of survivors, especially young children and those > 65 yr of age, exhibit permanent neurological and psychiatric sequelae. The genome of JEV (approximately 11 kb in size), upon translation, forms a single polyprotein, which is cleaved by host and viral proteases into three structural proteins, namely capsid (C), pre-membrane (prM), and envelope (E) proteins; and seven non-structural proteins, viz. NS1, NS2a, NS2b, NS3, NS4a, NS4b and NS5. The virus has a zoonotic transmission cycle between birds and mosquitoes, with swine serving as intermediate amplifier hosts, and the virus can spread from swine to humans through mosquito bites. The severity of JEV pathogenesis is governed by several factors. The inability of the host to produce antibodies against the virus is associated with an increased likelihood of the disease to turn lethal. Crossing the blood-brain barrier is an important factor in the increased pathogenesis and clinical outcome of the neurotropic viral infection. Through a mosquito bite, the virus enters the body and reaches the central nervous system (CNS) via leukocytes (presumably T-lymphocytes), where JEV virions subsequently binds to the endothelial surface of the CNS and are embodied by endocytosis; however, it is still unclear whether macrophages and B lymphocytes can also nurture JEV. The symptoms of JE generally develops in hosts after an incubation period of 5–15 days. It is possible that during this time, the virus dwells and proliferates within host leukocytes, which act as carriers to the CNS. T-lymphocytes and IgM play significant role in the recovery and clearance of the virus after infection. A feasible therapy of clearing the virus load while in its incubation period in peripheral lymphatic tissues and spleen may actually impede JEV pathogenesis. In addition to neuronal cells, astrocytes have also been found to be infected by JEV. Over the last decade, various studies have been undertaken to identify and characterize the differentially expressed genes (DEGs) in wide spectrum of tissue samples using microarray data from gene expression omnibus (GEO) repository. In 2013, Wu et al reported a similar kind of study on DEG in osteoporosis using microarray data. The objective of the present study was to find sets of possible marker genes, associated with JE by using computational methods and analysis. More specifically, the study was aimed to analyse and identify DEGs using microarray data of human microglial cells (CHME3) infected with JEV (P20778 strain) obtained from GEO (Accession No. GSE57330). Genes found to be differentially expressed during JE infection and the transcription factors associated with these DEGs might serve as probable drug targets for JE. Gene expression data (GSE57330) belonging to mRNA expression profile of microglial cells infected with JE was downloaded from the GEO database, which included samples of 12 human microglial cells (CHME3); six uninfected and six infected with JEV (P20778) strain. Chip data containing mRNA expression profile of human microglial cells were acquired by utilising the GPL15207 Affymetrix human gene expression array platform. Raw data were processed and normalized by the robust multichip averaging (RMA) method using affy packages of R (v.3.1.3). The linear regression model package Limma was used to classify chips into groups. The Bayes method was used to correct multiple testing inorder to adjust the statistical confidence measures between samples investigated. The log fold change, i.e. |logFC| >1 and p< 0.05 were used as cut-off to identify DEGs in diseased condition. Search tool for the retrieval of interacting genes/ proteins (STRING) database was used to identify interactions between DEGs. Known protein interaction networks are mostly scale-free, i.e. a lot of connections shared by few hubs (hub nodes), while few connections usually shared by the key hub of the network. The interaction pairs bearing scores > 0.9 were considered as hub gene candidates. The newly identified hub genes were set at the centre to construct protein-protein interaction network keeping human genome as reference using STRING database. Using the edge length among the interacting genes with the hub gene, protein-protein interaction network was constructed using Gephi tool. Gene ontology of the hub and its associated genes was performed using STRING and database for annotation visualization and integrated discovery (DAVID) tool. DAVID tool was used to predict interaction network of all genes. Enrichment of pathways was performed using hyper-geometric distribution algorithm [false-discovery rate (FDR) <0.05 and count >2]. The DNA-binding domain in transcription factors (TFs) binds to cis-acting elements in DNA sequences, which lead to either inhibition or enhancement of gene expression. The text mining-based utility of the free online tool EpiTect ChIP qPCR Primers was used for extracting TFs of the hub gene. Raw data were normalised to fix the measured intensities among control and JE infected samples, and screening out genes that were significantly differentially expressed. The distribution of data pre- and post-normalization was depicted by box plot and histogram [Figure 1]. Figure 1: Normalization of microarray data from GEO (Accession No. GSE57330). Box plots of the raw chip data pre- (a) and post- normalization (b); the blue and red colour of the box represents data from uninfected and infected samples respectively. The plots consist of boxes with a central line and two tails; the central line represents the median of the data, whereas, the tails represent the upper and lower quartile. Histogram of raw data pre-normalization (c); and post-normalization (d). According to the pre-set criterion |logFC| >1 and p <0.05 as a threshold value, only one DEG, i.e. signal transducer and activator of transcription 1 (STAT1) was obtained between the infected and uninfected samples. The STAT1 is a TF which in humans is encoded by the STAT1 gene. It is a member of the STAT protein family. The newly identified hub gene STAT1 was placed at the centre to construct an interaction network. The analysis from STRING database depicted that STAT1 interacts with 10 different genes, viz. STAT2, JAK1, JAK2, TYK2, IFNGR1, EGFR, IRF1, EP300, CREBBP and PIAS1 [Figure 2]. Subsequently, using the edge length between different genes and inbuilt force-field parameters, i.e. ForceAtlas2 and Fruchterman-Reingold force-field of Gephi, protein-protein interaction network was constructed [Figure 3]. The STAT1 showed strong interaction with JAK1 and JAK2, and least interaction with IFNGR1. 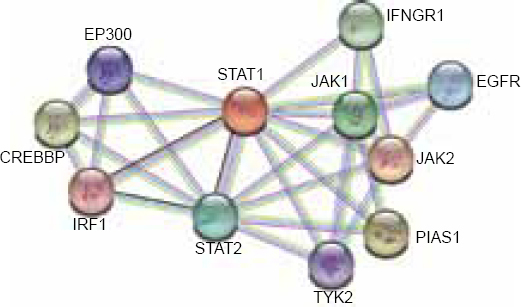 Figure 2: The protein-protein interaction network of STAT1 obtained from STRING database. The predicted network summarizes the network of predicted associations with other proteins. The network nodes are proteins and the edges signify the predicted functional associations. The coloured lines of the edges represent the existence of different types of evidence used in predicting the associations (Green: Neighbourhood evidence; Blue: Co-occurrence evidence; Purple: Experimental evidence; Light blue: Database evidence; and Black: Co-expression evidence). Further, the thickness of the edges specifies the degree of confidence prediction of the interaction. Figure 3: Protein-protein interaction networks of STAT1 employing Force Atlas2 (a and b); and Fruchterman-Reingold force (c and d) field using Gephi tool. The strength of the protein-protein interaction are depicted by different shades of blue colour (fading colour indicates decreasing strength). From this protein network, it can be hypothesized that STAT1 possess strong interaction with JAK1 and JAK2 and least interaction with IFNGR1. The sub-ontology analysis of 11 genes was carried out using STRING database and DAVID gene ontology tool. The genes with FDR < 0.05 were considered to be significant [Table 1] and [Table 2]. The important biological process associated with these genes were protein kinase cascade, peptidyl-tyrosine phosphorylation and peptidyl-tyrosine modification. The cellular components were identified as chromatin, an extrinsic component of cytoplasmic side of plasma membrane, nuclear chromatin, chromosome and intracellular non-membrane-bounded organelle. The important molecular function associated with these genes was reported as growth hormone receptor binding. Pathway-enrichment analysis performed using DAVID tool, uncovered one significantly enriched pathway (FDR <0.05), i.e. JAK-STAT signalling pathway. 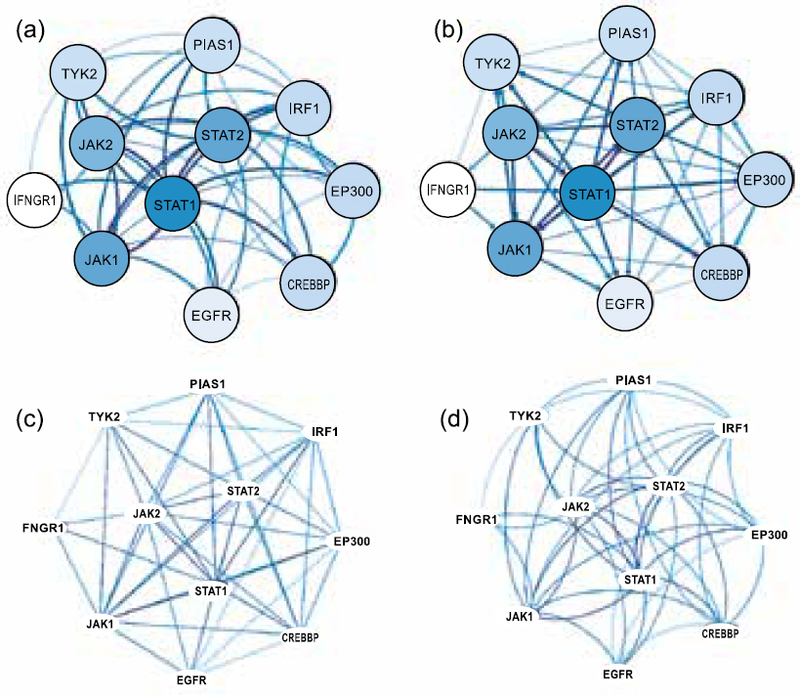 As evident from [Figure 2] and [Figure 3], most of the nodes were found to interact with STAT1, belonging to the tyrosine protein kinase family. Thus, it can be speculated that the hub gene, STAT1 interacts with tyrosine protein kinase family members and participate in JEV infection through the JAK-STAT pathways. A total of nine TFs including STATlα, STATiβ, p53, ISFG-3, STAT2, STAT3, IRF-1, STAT4 and STAT6 which binds to the promoter of the key gene STAT1 were identified along with their corresponding binding sites [Figure 4]. Figure 4: The list of transcription factors and binding sites of the hub gene STAT1 (indicated within a red circle). The red colour arrow indicates the starting site of the transcription, and green bars indicate the binding sites for each transcription factor. Most of the microarray experiments were performed to inspect patterns of gene expression by analysing the expression levels of thousands of genes in one platform. The key hypothesis behind each microarray analysis is that, the measured intensities for each arrayed gene symbolizes its relative expression level. Biologically, significant patterns of expression are generally identified by correlating measured expression levels between different states in various biological samples on a gene-by-gene basis. However, before comparing levels appropriately, a number of transformations must be performed on the raw data to remove ambiguous or low-quality measurements, to fix the measured intensities to simplify comparisons and screening out genes which get differentially expressed. There are commonly three normalization techniques, i.e. median, quantile, and cyclic loess. The quantile normalization method works excellent in reducing dissimilarities in miRNA expression values for duplicate tissue samples as compared to other two methods. Kumari et al have carried out cellular miRNA and mRNA expression analysis at multiple time points during viral infection in human microglial (CHME3) cells using Affymetrix microarray platform which revealed a phased pattern of miRNAs expression, associated with JEV replication and provided unique signatures of infection through an in silico analysis. In this study, the raw data was normalised using RMA method which was a form of Quantile normalisation. Regardless of the experiment carried out, the final result was intended to identify the DEGs between one or more pairs of samples in the data set. In an investigation, Yang et al performed a systematic mRNA profiling in spleens and brains of JEV-infected mice to globally identify candidate host genes associated with JEV pathogenesis. The microarray analysis showed that 437 genes in spleen and 1119 genes in brain were differentially expressed in response to JEV infection, with obviously up-regulated genes like pro-inflammatory chemokines and cytokines, apoptosis-related proteases and IFN inducible transcription factors. Most of DEGs are associated with antiviral response of host, which may provide important information for investigation of JEV pathogenesis and therapeutic method. In this study, the analysis of the chip data showed that the STAT1 was the only gene which was differentially expressed during JEV infection. Transcription factors are potential targets of new anti-JE drugs that are engaged in the regulation of gene expression and play an important role in the onset, invasion, and development of JEV. Screening of TFs led to identification of the nine TFs including STAT1 alpha, STAT1 beta, p53, ISFG-3, STAT2, STAT3, IRF-1, STAT4, and STAT6 along with their binding sites in the STAT1 promoter. Gupta and Rao were the first to report a detailed picture of the host transcriptional response in a natural route of exposure and opens up new avenues for potential therapeutic and prophylactic strategies against JEV. In another study, consistent up-regulation of CX3C chemokine receptor 1(CX3CR1) gene was observed on JEV exposed human microglia. CX3CR1 gene is a receptor for the fractalkine ligand CX3CL1 (chemokine (C-X3-C motif) encoded by the CX3CL1 gene in human. CX3CR1 and STAT1 are associated with microglial cells. The differential expression of gene CX3CR1 is found to be proportional to STAT1 in most of the diseases. CX-3CL1 is secreted essentially by neurons and binds to its receptor CX3CR1 in microglia, thus acting as messenger that is involved in neuron-microglia communication. The CX3CL1/CX3CR1 signaling pathway plays an important role in regulating microglial dynamics and migration, which is central for surveying neuronal function through lifespan. Since, CX3CR1 is mainly expressed by microglia and its unique ligand CX3CL1 is primarily expressed by neurons,, the CX3CL1/CX3CR1 signaling is central for microglia-neuron interactions regulating neuro-inflammation, neuro-protection as well as chemo-taxis. CX3CL1 inhibits the production of pro-inflammatory cytokines by microglia which could control neurotoxicity of JEV-infected microglia derived inflammatory factors in mice. Importantly, human microglia supported JEV replication; but infectivity was only transmitted to neighbouring cells in a contact-dependent manner which suggests that human microglia may be a source of neuronal infection and sustain JEV brain pathogenesis. Ligation of interferon (IFN) and its receptors leads to initiation of the activities of JAK1 and Tyk2 via tyrosine phosphorylation, which in turn excites the phosphorylation of STATs. Subsequently, phosphorylated STAT1 and STAT2 dimerize and correlate with IFN response factor 9 (IRF9), which ultimately leads to the formation of interferon-stimulated gene factor 3 (ISGF3) complexes. The formation of ISGF3 complexes in the cytoplasm results in nuclear translocation, followed by binding to the IFN-stimulated responsive element and subsequent expression of proteins including the IFN-stimulated antiviral proteins. Numerous cellular proteins have also been recognized as negative regulators of the JAK-STAT signaling pathway; these consist of the suppressor of cytokine signaling (SOCS) proteins, the protein inhibitors of activated STATs (PIAS), and the protein tyrosine phosphatases (PTPs),,,. in silico, in vivo and in vitro analysis of these drug-target interactions needs to be studied for development of novel therapeutics against JEV infection. The study was financially supported by the extramural research grant of the Indian Council of Medical Research, II phase of Biomedical Informatics Centres of ICMR Grant Number: BIC/12(19)/2013. The authors also acknowledge the Director, ICMR-Regional Medical Research Centre, Bhubaneswar for providing necessary infrastructure facilities. Solomon T. Flavivirus encephalitis. N Engl J Med 2004; 351: 370–8. Konno J, Endo K, Agatsuma H, Ishida N. Cyclic outbreaks of Japanese encephalitis among pigs and humans. Am J Epidemiol 1966; 84(2): 292–300. Burke DS, Lorsomrudee W, Leake CJ, Hoke CH, Nisalak A, Chongswasdi V, et al. Fatal outcome in Japanese encephalitis. Am J Trop Med Hyg 1985; 34: 1203–10. Ghosh D, Basu A. Japanese encephalitis—A pathological and clinical perspective. PLoS Negl Trop Dis 2009; 3(9): e437. Barrett T, Wilhite SE, Ledoux P, Evangelista C, Kim IF, Toma-shevsky M, et al. NCBI GEO: Archive for functional genomics data sets-Update. Nucleic Acids Res 2013; 41: D991–5. Wu XM, Ma X, Tang C, Xie KN, Liu J, Guo W, et al. Protein-protein interaction network and significant gene analysis of osteoporosis. Genet Mol Res 2013; 12(4): 4751–9. Kumari B, Banerjee A, Vrati S. mRNA expression profile in CHME3 cells infected with Japanese encephalitis virus. Gene Expression Omnibus Accession No. GSE57330. Available from: https://www.ncbi.nlm.nih.Gov/geo/query/acc.Cgi ?acc=GSE57330 (Accessed on March 4, 2016). Irizarry RA, Hobbs B, Collin F, Beazer-Barclay YD, Antonellis KJ, Scherf U, et al. Exploration, normalization, and summaries of high density oligonucleotide array probe level data. Biostatistics 2003; 4(2): 249–64. Team RC. R: A language and environment for statistical computing. Vienna, Austria: R Foundation for Statistical Computing 2013. Available from: https://www.r-project.org/ (Accessed on May 5, 2016). Smyth GK. 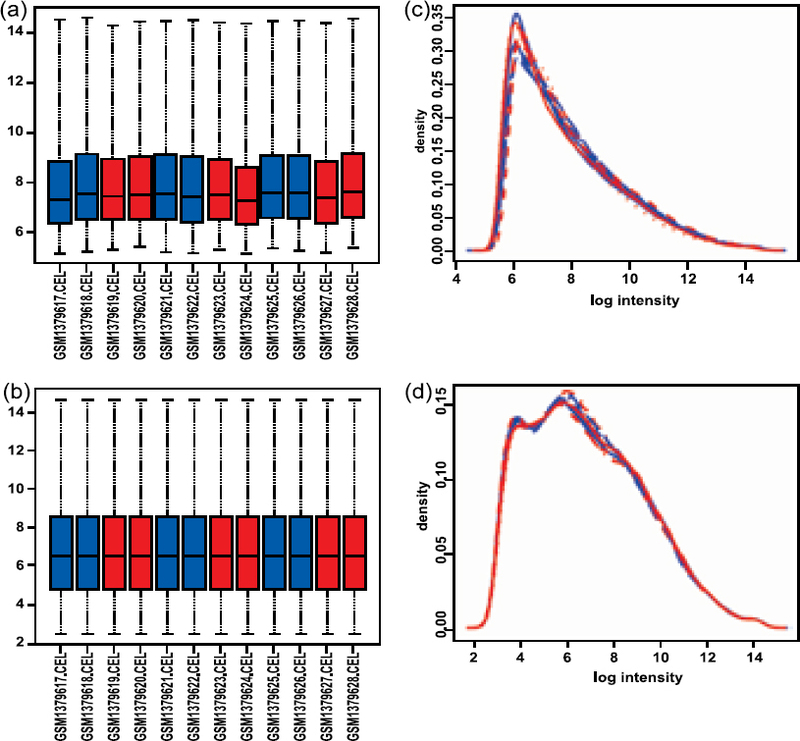 Limma: Linear models for microarray data. In: Gentleman R, Carey V, Huber IV, Irizarry R, Dudoits, editors. In: Bioinformatics and computational biology solutions using R and bioconductor. New York: Springes 2005; v: 397–420. Benjamini Y, Hochberg Y. Controlling the false discovery rate: A practical and powerful approach to multiple testing. JR Stat Soc B 1995; 57(1): 289–300. Qi DC, Wu B, Tao SL, Zhou J, Qian HX, Wang D. Analysis of differentially expressed genes in malignant biliary strictures. Genet Mol Res 2014; 13(2): 2674–82. Szklarczyk D, Franceschini A, Kuhn M, Simonovic M, Roth A, Minguez P, et al. The STRING database in 2011: Functional interaction networks of proteins, globally integrated and scored. Nucleic Acids Res 2011; 39: D561–8. Albert R. Scale-free networks in cell biology. J Cell Sci 2005; 118(21): 4947–57. Lamb J, Crawford ED, Peck D, Modell JW, Blat IC, Wrobel MJ, et al. The Connectivity map: Using gene-expression signatures to connect small molecules, genes, and disease. Science 2006; 313(5795): 1929–35. Bastian M, Heymann S, Jacomy M. Gephi: An open source software for exploring and manipulating networks: International AAAI Conference on Weblogs and Social Media 2009. Available from: https://gephi.org/ (Accessed on June 12, 2016). Huang DW, Sherman BT, Lempicki RA. Systematic and integrative analysis of large gene lists using DAVID bioinformatics resources. Nat Protoc 2009; 4(1): 44–57. Stower H. Gene regulation: Resolving transcription factor binding. Nat Rev Genet 2012; 13(2): 71. Han L, Suzek TO, Wang Y, Bryant SH. The Text-mining based PubChem bioassay neighboring analysis. BMC Bioinformatics 2010; 11: 549. Wu W, Dave N, Tseng GC, Richards T, Xing EP, Kaminski N. Comparison of normalization methods for CodeLink Bioarray data. BMC Bioinformatics 2005; 6: 309. Quackenbush J. Microarray data normalization and transformation. Nat Genet 2002; 32: 496–501. Rao Y, Lee Y, Jarjoura D, Ruppert AS, Liu C-G, Hsu JC, et al. A comparison of normalization techniques for micro RNA microarray data. Stat Appl Genet Mol Biol 2008; 7(1): Article 22. Kumari B, Jain P, Das S, Ghosal S, Hazra B, Trivedi AC, et al. Dynamic changes in global microRNAome and transcriptome reveal complex miRNA-mRNA regulated host response to Japanese encephalitis virus in microglial cells. Sci Rep 2016; 6: 20263. Yang Y, Ye J, Yang X, Jiang R, Chen H, Cao S. Japanese encephalitis virus infection induces changes of mRNA profile of mouse spleen and brain. Virol J 2011; 8: 80. Gupta N, Rao PV. Transcriptomic profile of host response in Japanese encephalitis virus infection. Virol J 2011; 8: 92. Paolicelli RC, Bisht K, Tremblay MÈ. Fractalkine regulation of microglial physiology and consequences on the brain and behavior. Front Cell Neurosci 2014; 8: 129. Harrison JK, Jiang Y, Chen S, Xia Y, Maciejewski D, McNamara RK, et al. Role for neuronally derived fractalkine in mediating interactions between neurons and CX3CR1-expressing microglia. Proc Natl Acad Sci USA 1998; 95(18): 10896–901. Hatori K, Nagai A, Heisel R, Ryu JK, Kim SU. Fractalkine and fractalkine receptors in human neurons and glial cells. J Neurosci Res 2002; 69(3): 418–26. Zujovic V, Benavides J, Vige X, Carter C, Taupin V. Fractalkine modulates TNF-alpha secretion and neurotoxicity induced by microglial activation. Glia 2000; 29(4): 305–15. Das S, Mishra MK, Ghosh J, Basu A. Japanese encephalitis virus infection induces IL-18 and IL-1 beta in microglia and astrocytes: correlation with in vitro cytokine responsiveness of glial cells and subsequent neuronal death. J Neuroimmunol 2008; 195(1–2): 60–72. Lannes N, Neuhaus V, Scolari B, Kharoubi-Hess S, Walch M, Summerfield A, et al. Interactions of human microglia cells with Japanese encephalitis virus. Virol J 2017; 14(1): 8. Chmiest D, Sharma N, Zanin N, Viaris de Lesegno C, Shafaq-Zadah M, Sibut V, et al. Spatiotemporal control of interferon-induced JAK/STAT signaling and gene transcription by the retromer complex. Nat Commun 2016; 7: 13476. Weidinger S, Klopp N, Wagenpfeil S, Rümmler L, Schedel M, Kabesch M, et al. Association of a STAT 6 haplotype with elevated serum IgE levels in a population based cohort of white adults. J Med Genet 2004; 41(9): 658–63. Jiang G, Zhang L, Zhu Q, Bai D, Zhang C, Wang X. CD146 promotes metastasis and predicts poor prognosis of hepatocellular carcinoma. J Exp Clin Cancer Res CR 2016; 35(1): 38. Baran-Marszak F, Feuillard J, Najjar I, Le Clorennec C, Béchet J-M, Dusanter-Fourt I, et al. Differential roles of STAT1α and STAT1β in fludarabine-induced cell cycle arrest and apoptosis in human B cells. Blood 2004; 104(8): 2475–83. McDermott U, Longley DB, Galligan L, Allen W, Wilson T, Johnston PG. Effect of p53 status and STAT1 on chemotherapy-induced, Fas-mediated apoptosis in colorectal cancer. Cancer Res 2005; 65(19): 8951–60.